Next time you buy celery, save the leaves to eat alone or incorporate into recipes. 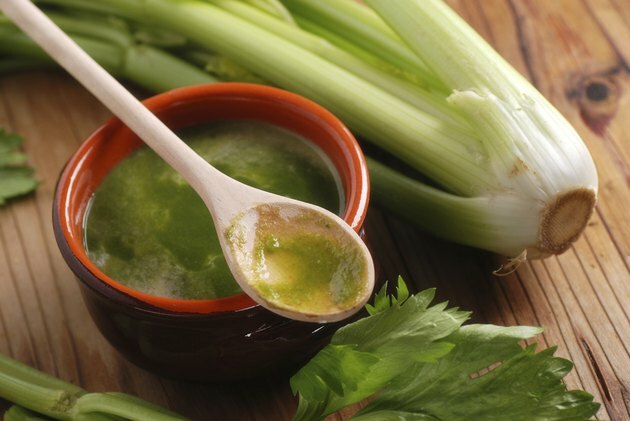 Celery leaves offer nutritional value that can boost your health. Celery leaves make a good choice for weight-loss diets because they are low in calories and provide vitamins, minerals, fiber and macronutrients. A 100-gram serving of celery leaves, about 3.5 ounces, introduces 34.8 calories into your meal plan. If you follow a 2,000 calorie diet, the quantity in these leaves equates to 1.7 percent of your total allow able calories in a 24-hour period. You also take in 0.3 grams of fat. The majority of the fat in celery leaves derives from polyunsaturated fat, a kind of healthy fat that positively influences cholesterol levels and may lower your risk of heart disease. Because the calories in a 3.5-ounce serving of celery leaves is low, so are the number of carbohydrates available. One portion of these leaves provides 8.2 grams of carbohydrates, which is only a small portion of the 130 grams of carbs your body needs each day. You get 3.9 grams of fiber in a serving of celery leaves, which contributes to the 25 to 38 grams of fiber you should consume each day. Celery leaves are a source of calcium, containing 325 milligrams in each 3.5-ounce serving. This is a considerable portion of the 1,000 to 1,200 milligrams you need on a daily basis to shore up the strength of your bones. The calcium available in celery leaves also influences nerve health and muscle function. Eat celery leaves to boost your intake of vitamin E. A 3.5-ounce serving of this oft-disposed of vegetable provides 2.7 milligrams of this vitamin; the daily recommended intake of vitamin E stands at 15 milligrams per day. The vitamin E you get in celery leaves offer antioxidant protections to your cells. Consume a serving of celery leaves, and you take in 10 micrograms of iodine. This is only a small bit of the 150 micrograms of iodine you need every day. Increase your iodine intake by pairing celery leaves with foods rich in this mineral such as sea bass, perch and haddock.